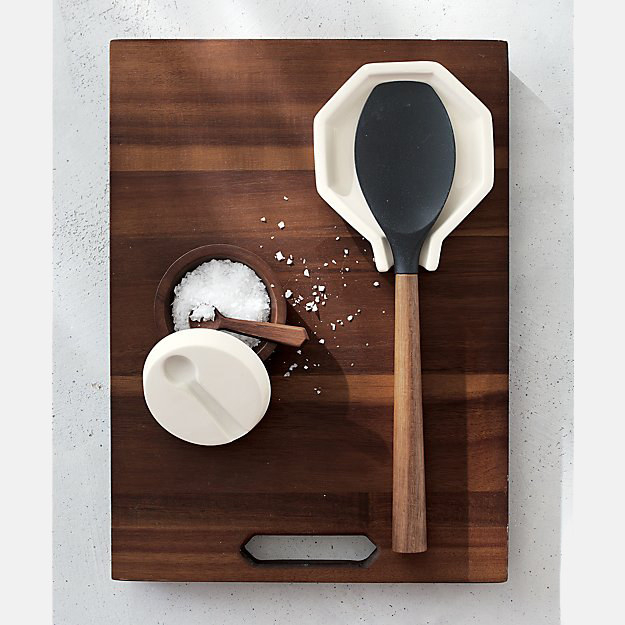 These products will make your kitchen minimalist perfection. Get them from Amazon for $20.99 (available in nine colors). 2. A gorgeous salt cellar with a lid that holds your spoon when you want to sprinkle it yourself like Salt Bae. 3. A stovetop whistling kettle, which may be just what you need if you prefer boiling water the old-school way. 4. A set of elegant salt and pepper grinders you can use as part-time art installations. Get them from Amazon for $74.95. 5. A collapsible bread box so you can keep your loaves and kitchen style fresh. 6. A revolving spice rack so you can store up to 16 different spices in the sleekest way possible. The jar includes the spice rack and 16 pre-filled spice jars. The spice assortment varies and can include basil, thyme, parsley, marjoram, garlic salt, coriander, rosemary, oregano, and other spices. And each of the jars are labeled. Get it from Amazon for $36.16. 7. A lovely stainless-steel Vinglacé Wine Insulator which'll keep your favorite bottle of bubbly or wine nice and chill for hours — thanks to its double-walled, vacuum-insulated design. Get it from Amazon for $95.69. 8. A set of stainless-steel knives in a sleek acrylic block that’ll have you cutting up with your recipe inspirations. 9. A hand-held mandolin with a soft-grip knob and stainless-steel blade to let you slice fruits, veggies, and other cooking ingredients like a pro. 10. A pretty marble cutting board for slicing and dicing ingredients or preparing dough for pastries and other baked dishes. Get it from Amazon for $36.49 (available in two colors). 11. A set of handmade glass straws which'll keep you fabulous with every sip. 12. A set of dashing KitchenAid gadgets so you can finally have all the cooking tools you need in one handsome package. 14. A set of copper and enamel measuring spoons so your kitchen can have an extra dose of shine. Get them from West Elm for $14.99. 15. A steel dish rack that includes a wineglass holder and is fingerprint-proof to keep smudges from ruining your kitchen’s lovely ambiance. 16. A set of square dinnerware for a sleek canvas to show off the lovely details of your meals. Because we know presentation is everything. 17. Or a set of ceramic stoneware with clean lines to immediately dress up your table. The set includes four dinner plates, four appetizer plates, four salad plates, four appetizer bowls, and from salad bowls. 18. A stainless-steel rolling pin that'll immediately put your boring wooden one out of commission. 19. A cordless electric kettle for maximum coolness when you pour your next round of tea. 20. A set of nonstick cookware so they can take their home-chef game to tasty new heights without worrying about a messy cleanup. 21. And a set of breathtaking, handcrafted Lockjaw knives you can count on to slice, dice, chop, and look magnificent in your kitchen for years. Get them from CB2 for $200+. 22. A set of fuss-free labeled canisters to keep your pantry or countertop organized — even while you’re sneaking a late-night snack. The canisters should only be hand-washed. Get them from West Elm for $24+ each. 23. A glass milk carton creamer that’ll add a nice touch of whimsy to your coffee-making routine. 24. An 11-piece set of Calphalon nonstick cookware in a soothing shade of gray that better have you rushing to cook your next Top Chef–worthy dish. Get them from Williams-Sonoma for $429.95.